The car took on a life of its own, gliding silently across the thin layer of snow. The french country roads gently curved around the steep hills and vineyards lay below in the valleys. My three year old son sat peacefully in the back. My worst nightmare was in process. We were going over the edge, and there was nothing in all the world I could do about it. The next moment, the airbags exploded, snapping my mind back into my body. It was then I looked around in complete wonder. We were both absolutely fine. I decided to try to paint, to create something of my own using my dormant skills as a textile designer. How did I find myself sitting in a mangled old Volkswagen, seven meters down from the road, in the snowy vineyards of Southern France? Six years before, I had been on the greatest journey of my life. I was forty years old, single and childless and I made up my mind to follow my greatest heart longing, to become a mother. It was a journey like no other. One bitter disappointment after another, fuelled my wish and kept me moving, one day at a time, towards meeting my child. For the first time in my life, I was not prepared to give up, in fact there was no choice. The birth of my son was my ultimate joy. A year after Mika was born, I returned to work as a stylist in London, but nagging thoughts regarding our future began to creep in. My instagram account told its own story. I followed creative mothers, who lived in romantic far flung places, whose children enjoyed being lost in nature, dirt under finger nails. Kids foraged for berries, fed chickens and ran wild and free, a very different world from the one we were living in East London. When I received a job offer in the South of France, I seized the opportunity for a new life. I packed up everything, rented out my little flat and headed off, naive to the challenges that lay before me. I was about to embark on a whole new journey of fertility, an opportunity to apply all I had learnt in trying to conceive Mika. I was about to birth a new creative career. At that time there were no thoughts of rekindling the latent creativity within. Yet life continually throws what looks like hurdles in our path, blessings disguised as challenges. The organisation I was about to begin work with, explained that due to an unforeseen financial crisis, they could no longer offer me employment. The shock reverberated through my whole system. I couldn’t imagine going back to London. I was a single mum with no job, unable to claim any benefits and with very little savings to fall back on. I calculated I could stay three months and that would be that. I decided to try to paint, to create something of my own using my dormant skills as a textile designer. This was a moment of conception. The challenge was great, yet it was life conspiring with me. The loss of the job seemed completely overwhelming but yet at the same time it pushed me to take a leap of faith. As many obstacles as there were, there were miracles. 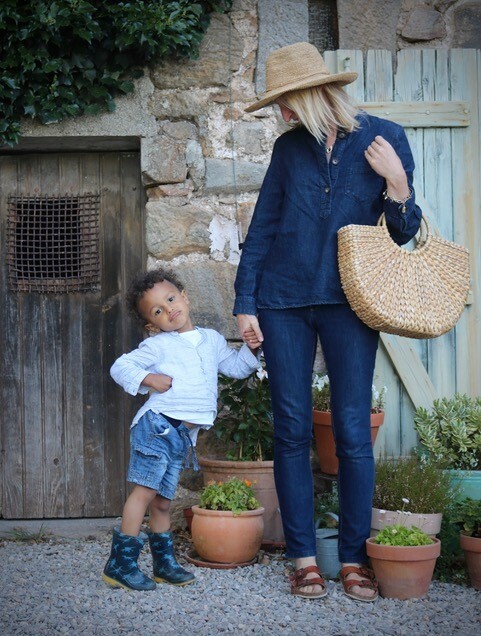 Navigating the legalities of setting up a small business in France, establishing Mika in childcare and trying to find and register a car, were all confusing and daunting in equal measure. My grasp of the french language is basic, so many times I felt utterly defeated. However as my bank balance began to diminish, the miracles kicked in. I met an old acquaintance, who lived in the countryside. She had a little empty house, that she used for guests. If we needed a place to stay we were welcome! Every time, I thought, this is not possible, magic happened. And so it was with the old Volkswagen that a friend offered to me. By yet another miracle we survived our accident unscathed. The car however did not. Each disappointment I experienced whilst trying to conceive my son, strengthened me and made the outcome even more transformative. It slowly became clear to me, how I could use those past experiences to encourage myself to make and sell art. Here is a link to my instagram where you can follow some of mine and Mika's adventures.